Neodymium cylinder magnets are typically used in medical, sensor, read switches, meters, and holding applications. 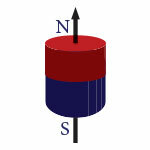 Neodymium Cylinder magnets can be magnetized through the length or across the diameter. The shape of a neodymium cylinder magnet produces a magnetic field with a longer reach. If you require a specific size that is not available on our website, please contact us or use our online custom magnet quote form.